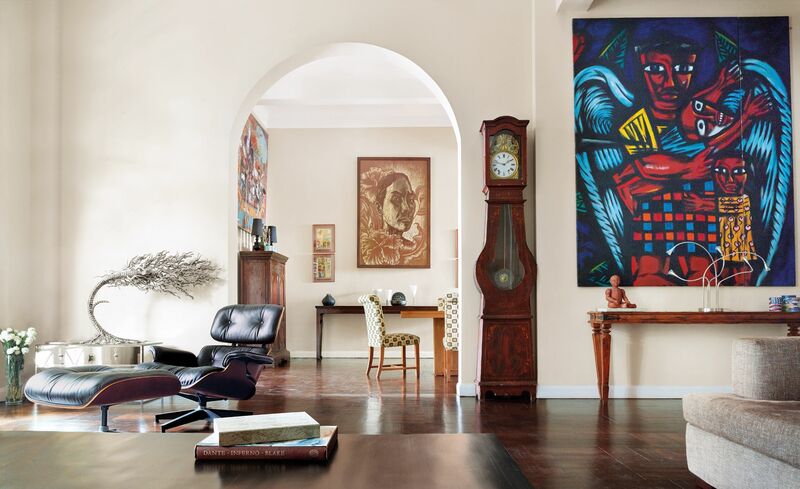 Tucked away behind the crest of a small steep hill off Hong Kong’s Conduit Road is a three-storey art deco building circa 1930 that, over the past two years, has been the home of art collector and editor Rex Aguado and his partner, financial executive search specialist Harry O’Neill. “We’ve always looked for interesting properties to live in, and loved that this building still had the classic geometry, high ceilings, and distinctive details of the art deco period,” says Rex, who snapped up the architectural gem after hearing from friends that one of the three apartments was about to become available. “The building has many authentic art deco details, like a beautiful green and white tiled entrance floor, stained-glass windows, and a glamorous, curvaceous central staircase—so we were happy the landlords, descendants of the original owner, allowed us to make the changes we had in mind,” Rex says. Moving from their previous home—an airy 7,500-square-foot house in Clearwater Bay—to a space that was about half of the floor area called for a serious edit, with numerous artworks placed in storage. “You have to work as a couple—although it helps having a space big enough to absorb different tastes,” Rex says with a laugh.